Andy Warhol repeated images of his subjects in varied ways, concurrently and across time, and in diverse media. Andy Warhol: Subject and Seriality will explore the artist’s iconic approach to his subject matter through prints, photographs, and multiples both from the Neuberger Museum of Art’s own collection as well as those of the other Warhol x 5 collaborative New York museums: the University Art Museum, University at Albany, SUNY; the Samuel Dorsky Museum of Art, SUNY New Paltz; the Frances Lehman Loeb Art Center, Vassar College; and the Center for Curatorial Studies, Bard College, each of which had focused through their own exhibitions on unique aspects of Warhol’s work. 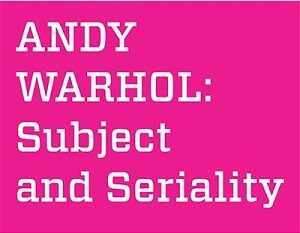 Andy Warhol: Subject and Seriality is organized by the Neuberger Museum of Art, Purchase College, State University of New York, and curated by Jacqueline Shilkoff, Curator of New Media and Director of Digital Initiatives. Generous support for this project is provided by ArtsWestchester with support from the Westchester County Government; the Friends of the Neuberger Museum of Art; and the Purchase College Foundation. The Neuberger Museum of Art opened on the campus of Purchase College, SUNY, in 1974 with a core collection donated by one of the greatest private collectors, philanthropists, and arts advocates of the twentieth century, Roy R. Neuberger. Today, the Neuberger is more active and vibrant than ever. Critically acclaimed exhibitions and a wealth of educations tours, lectures, and interactive programs engage the many parts of our broad community. The Neuberger is a center of teaching and learning for all ages.